Destructive Delay, written by Tania Unzueta and co-authored by B. Loewe, illuminates the inhumane interior Immigration and Customs Enforcement practices that continue unabated while the President postpones action and it highlights the human cost of the delay. The key findings shed light on an agency driven by one calculated mission, to meet a draconian deportation quota, regardless of the costs to public safety, institutional integrity, moral or constitutional considerations. 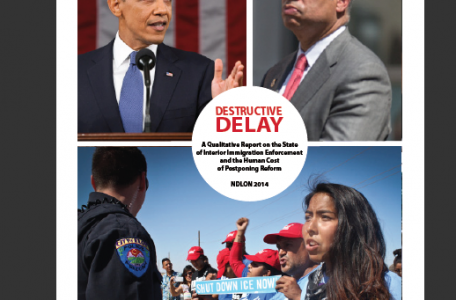 Through almost three dozen interviews with front-line organizers, legal experts, and people in deportation proceedings, Destructive Delay collects previously disparate and disconnected stories of the lived experience of ICE enforcement activity into a single document. The report provides real-life context for the rhetoric of the debate and gives an inside look into how immigration policy is actually working on the ground. Javier Nava, the only one released in a fifty person raid in Georgia says, “Without introducing themselves the agents came into my house. A few minutes into the conversation one of the agents who spoke Spanish said that they were with immigration.